Kipling would have felt at home here at Theindawgyi Pagoda, found pretty much smack bang in the middle of town, dominating the market and clock tower area. Browse places to stay in Myeik on Booking.com. Book Now - Pay Only When You Stay. This is the most popular pagoda in town for locals and the handful of tourists alike, though while the former come to make offerings and prayers, the picturesque view is the principal draw for overseas visitors. The huge gold chedi is the main temple feature, surrounded by a crimson and gold painted base, which houses day of the week shrines. Other shrines in the complex contain a variety of Buddha images but really, most come here to admire the splendid view over town, the harbour and offshore islands. Apart from the absence of other tourists and lack of a lift, you could almost think yourself in Mawlamyinehere, where a similar large golden chedi overlooks the port and islands from a pagoda above Strand Road. 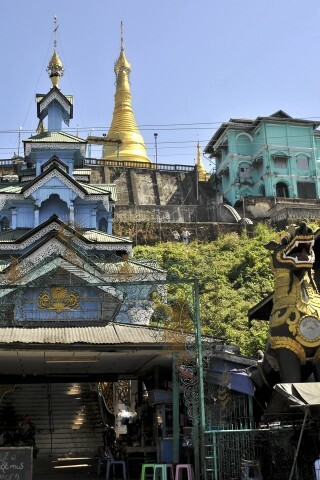 Without the crowds of Mawlamyine’s pagodas the atmosphere is peaceful and serene. The pagoda faces due west so dusk is the moment to time your visit -- though down by the jetty or Grand Jade’s rooftop cafe are also top sunset spots. You’ll just have to stay three nights! The pagoda can be reached by a steep flight of steps from the market or a gentler climb up Office Road. The east entrance is also easily reached from the nearby Sun Guesthouse and Hotel Grand Jade.